Paneer Dosa is a crepe made with spicy cottage cheese filling. A favorite heartwarming South Indian breakfast dish. And also a fusion food made with South Indian base and with North Indian style masala filling. Let us learn how to make this comforting Paneer dosa with step by step pictures and a quick video. This is a vegan, vegetarian, gluten-free, cleaning eating and real food Indian recipe. This paneer Dosa is one of the essential vegetarian recipes which is served in almost all the restaurants in Chennai, India. Since it has the flavors of both the region, it is welcomed throughout the country. 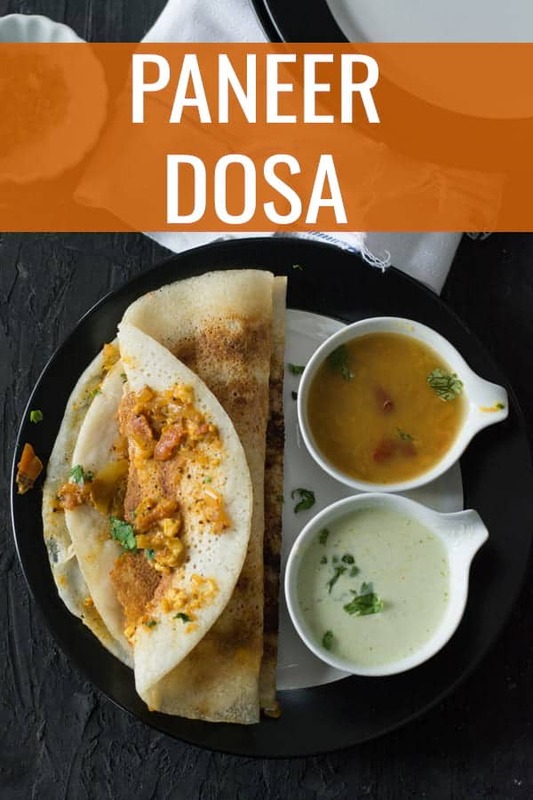 Dosa is the staple South Indian food. But Paneer dosa is not an authentic or traditional recipe of this zone. And this became more popular the same time when dosa became popular in Northern India. 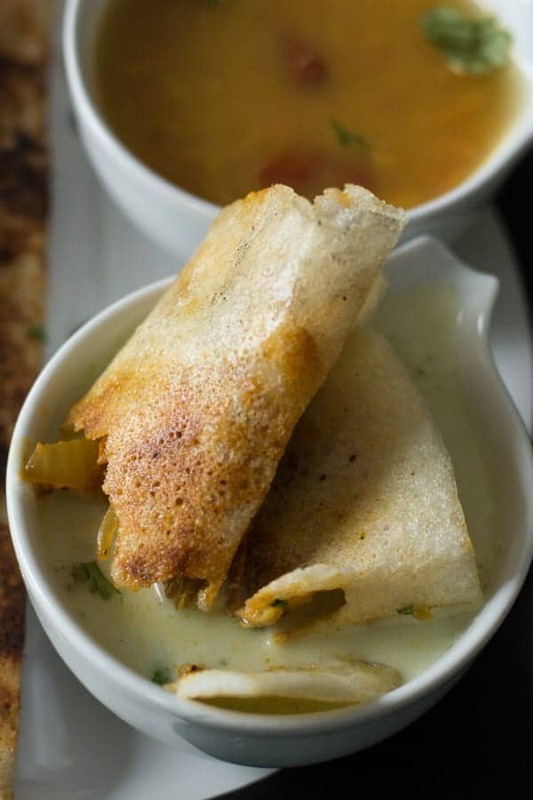 This dish might have originated when North Indian started customizing dosa to their palates. 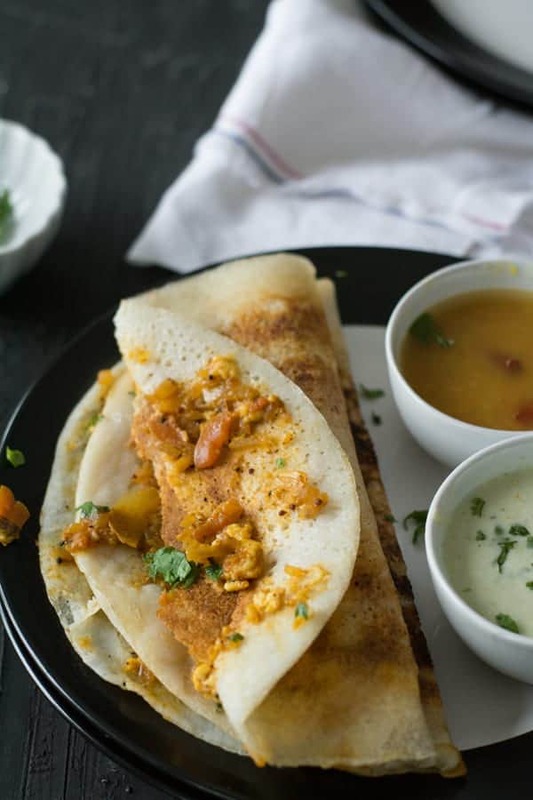 Dosa is made with fermented batter of rice and lentils. And the filling is made of cottage cheese with onion and tomato gravy. Can be served as a main course at breakfast or dinner times. My son loves Paneer dosa and wishes to repeat eating the same again and again during our stay in Chennai. Every restaurant has their unique taste and he likes them all. But we do not get the real flavorful Paneer dosa here in Central Pennsylvania. Though we have the couple of restaurants nearby, we are not getting that authentic taste like in the Chennai restaurants. So, what is next in the story? It is, of course, recreating them in our kitchen. This is not as hard as you think to do it. All the ingredients are available in Indian stores of the United States. And with all the small tips and secrets we can make the same authentic and delicious paneer dosa in the comfort of our kitchen. It’s winter here, and it is getting darker by 4:30 in the evening. Hence, we have a longer. And to be at home today as it is almost 28 Fahrenheit in the first week of December. At times, we feel lonely and will be missing our family and the food that we loved the most in the past. When my son asked me to make this I immediately said ‘yes.’ Since this recipe is easy and quick to make. 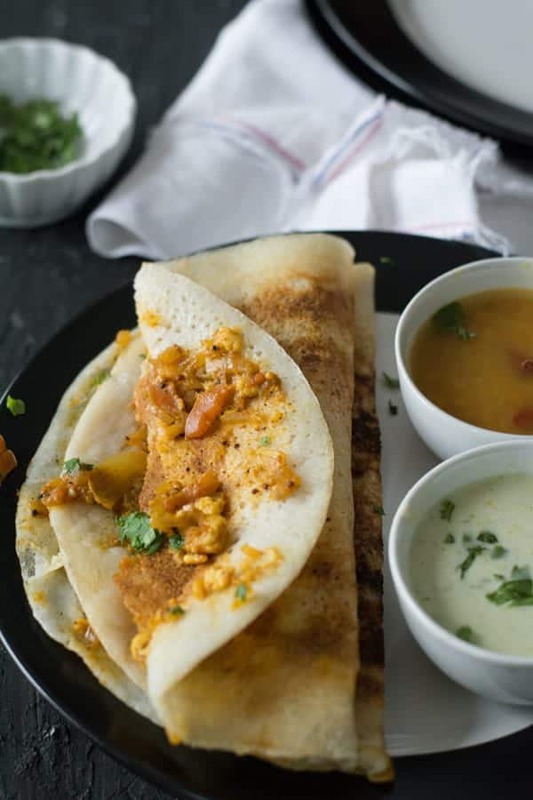 Paneer dosa is best to serve with sambar and coconut chutney. The Chutney powder, the garlic chutney, radish chutney, cabbage chutney would also be the best good companions. This Radish sambar and Udipi sambar also taste great. Generally speaking, since the filling is spicy and usually do not need a side dish. 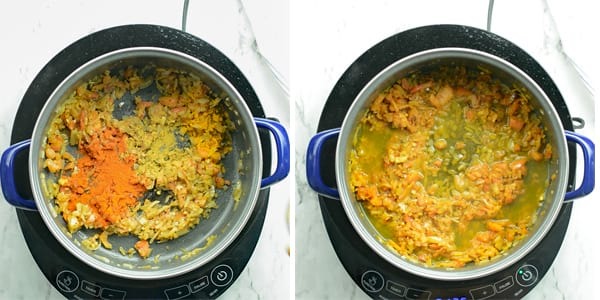 The curried mixture by itself makes it as a stand-alone food. How does this paneer dosa taste like? This paneer masala dosa has two layers of taste. 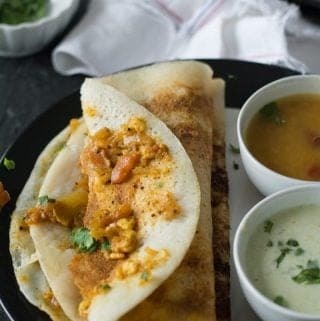 Dosa, the base is crispy, and the texture is similar to western crepes which tastes mild and subtle with a hint yeast flavor. To its contrast, the filling is exotic and spicy with the bold flavors. The combination of these contrast elements gives the eminent pleasure of eating. How long can you store? You can store the Dosa batter and the paneer filling separately. And cook by combining them whenever needed. The cooked paneer dosa will not stay good after an hour. It is best to be eaten as soon as it is prepared. But the batter can be stored up to a week in the refrigerator, and the stuffing also stays good for a week if refrigerated. Like Pizza parties, Dosa is parties also famous among the Indian families. And if you are planning for such a party or if you want to prepare ahead of time, you can do it. Both the batter and the filling can be made ahead of time. To say precisely, you can make it 2-3 days before the party day by refrigerating in a sealed container. Can we make this a recipe healthier? If you worry about the carbohydrate in the rice in this paneer dosa recipe, then, you may substitute rice with quinoa. You may also add green peas or grated carrots or beets into the paneer filling to make it nutritious and more vibrant. Adding veggies to the stuffing is an intelligent idea to include more vegetables in our diet. Dosa batter is available in the Indian stores. You can also make your own. Making dosa batter does not require any expert knowledge, all you need it time and patience to make it. This is the cottage cheese, one of the famous dairy products of the North Indian region. The process of making is straightforward even for the people who visit the kitchen occasionally. To make this, boil the milk and cuddle it by adding vinegar. And strain them, that is all, the freshest Cottage paneer is prepared with ease. Alternatively, you may get from the Indian store’s frozen aisle. The best equivalent substitute would be the ricotta cheese or Mexicans’ fresco cheese. This is the secret ingredient which makes the usual paneer gravy to a restaurant-style rich paneer gravy. This gives a bold and robust flavor which changes a regular dish to outstanding food. So, I would not recommend skipping in its absence. Instead, you may substitute with ground cinnamon and bay leaves. Fry the bay leaves in oil before adding to the dish. Frying them gives a wholesome round flavor. 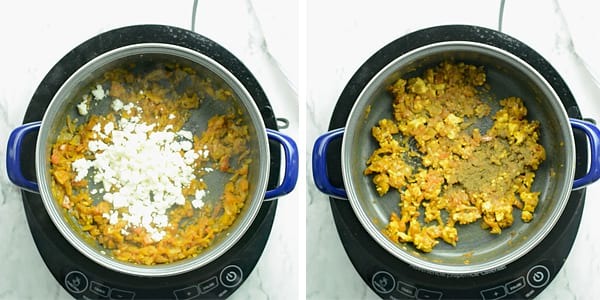 You may add grated carrots which give a nicer color and a hint of sweet taste to paneer dosa. Cauliflower florets can also be added. Chop them finely and dry roast them before adding to the gravy. Roasting keeps them retaining the texture, on the other hand, adds a crunchy feeling. Add minced mint leaves or cilantro leaves for garnishing. The same filling can also be used as the spread while making sandwiches. If coriander powder is not available to you, you may skip this ingredient as it will not break the recipe. I have mentioned the quantity of paneer as half a cup for this recipe. But you may increase it if you prefer a rich cheesy filling. How to make a paneer dosa? In a pan add cooking oil and onion. Cook until onion becomes translucent. 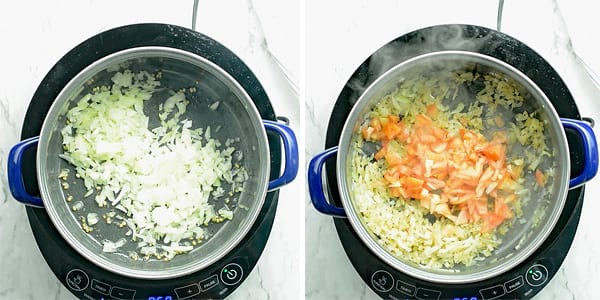 If the onion sticks to the bottom of the pan, then add another tablespoon of oil. Then add chopped tomatoes and salt and continue to cook until tomatoes become mushy. The salt we have added makes the tomatoes cook faster and even. Once the gravy start thickens, add red chili powder, coriander powder, turmeric powder. Cook it low flame till it changes its color slightly. These will get burned quicker, so always do this part in very low flame. Now stir in water and continue to cook with the lids on. Stir occasionally in between. When the gravy thickens then add garam masala and fry for few seconds. Remove it from the flame and keep aside. 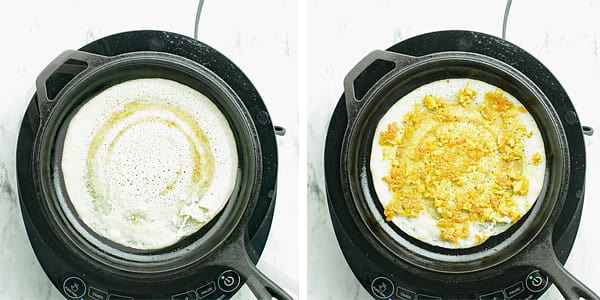 In a griddle pour 1/4 cup dosa batter and spread evenly in a circular motion. Drizzle a teaspoon of oil and cook it in medium flame. Cook till it turns crispy and changes the color to golden brown on the edges. Now add a tablespoon of paneer filling to the center and spread evenly to the entire surface of the dosa. Then sprinkle chopped coriander leaves. Close half of the side on to the other to make it look semi-circular. Paneer Dosa is a fermented crepe made with spicy cottage cheese filling. One of the important South Indian breakfast dish popular throughout India. Very Delicious and easy to make recipe. In the pan add 2 tbsp of cooking oil followed by chopped onion. Cook it till it becomes translucent. Cook further till tomatoes becomes softer. Now add red chili powder, coriander powder, and turmeric powder. Sauté for few seconds. And add water. Cook by covering with the lid until the masala thickens. Add paneer and give a gentle stir till the masala combines well with paneer. Finally, add garam masala and combine them well. To make dosa, heat a griddle in a medium flame. Pour about a quarter cup of batter and spread in a circular motion using a flat spoon. Cook until the edges become crispy. Then keep a tablespoon of paneer masala at the center and spread evenly. Close half of the dosa to make it semicircular. Serve hot with the chutney or sambar. Suja, you’ve just posted one of my favorite dishes when I traveled in India. Any kind of dosa or idlis works for me. I’ll have to search on my online Indian food shop and see if I can find the batter mix. Thanks for sharing a great post and your photos are great. I have tried masala dosa, plain dosa, maisore dosa, rawa dosa. But I never tried a paneer dosa. I have seen it in the menu of restaurants. I think i should have taste try it first in the restaurant. Or i can try it when i make the masala dosa. One difference is in the stuffing of the dosa. So, next time when i make the masala dosa I will try this one also.